Unlike many of my composting experiments, this is a traditional compost pile of alternating layers of carboniferous and nitrogenous materials. 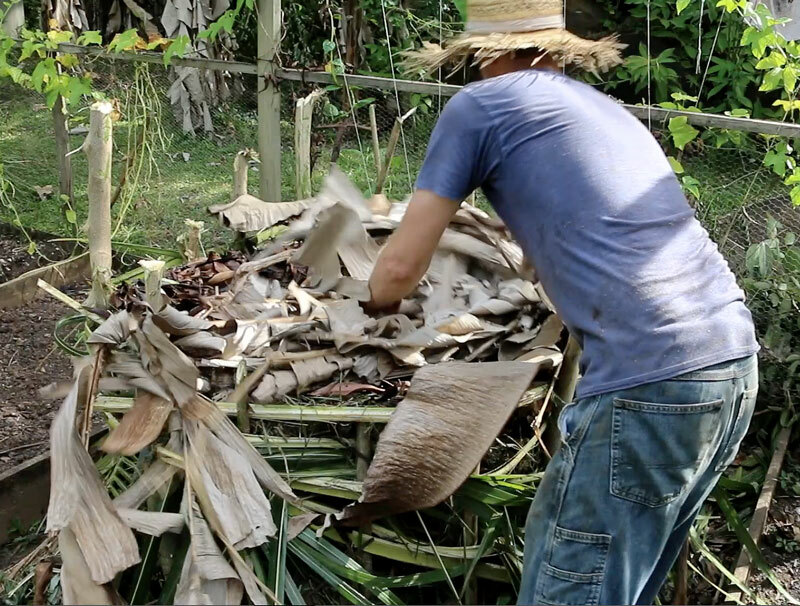 The boundary is made from cut limbs hammered into the ground and woven about with palm fronds. 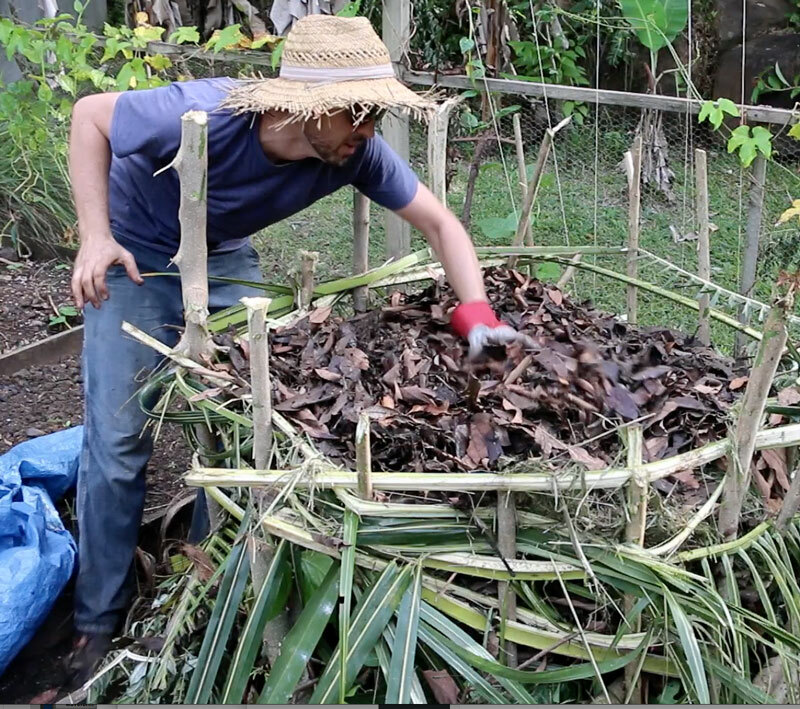 I also added homemade biochar to this compost pile to get it “charged” for future projects. The C/N ratio in this pile should be about perfect with the greens and browns but if it doesn’t get hot enough I can always pour on some diluted urine to raise the nitrogen levels. 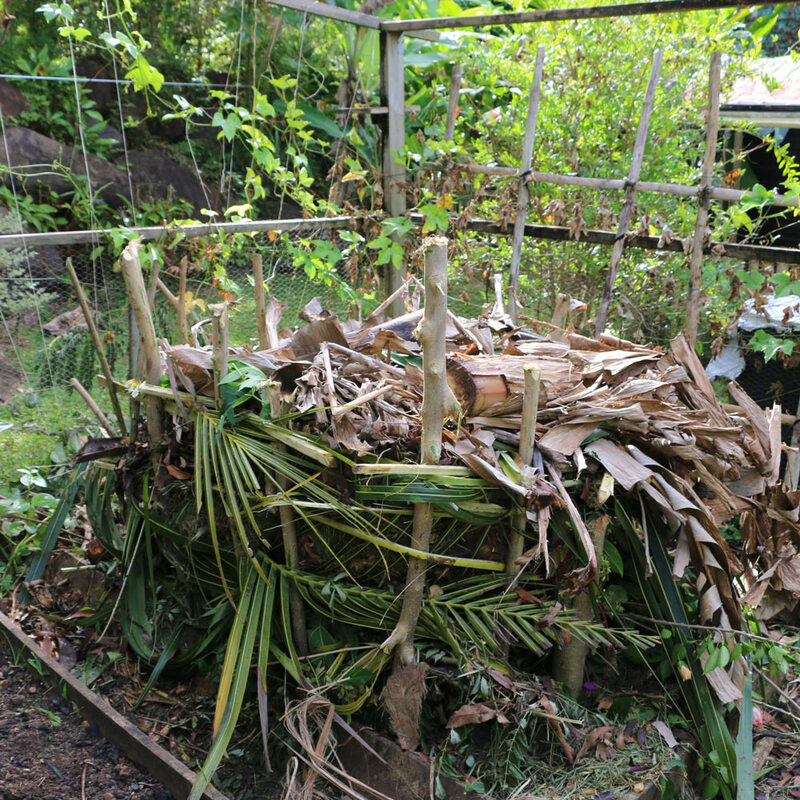 This simple compost pile can be set up anywhere in about an hour using local materials. I’ve done this in a cornfield before, cutting and chopping old stalks for the base, then adding on layers of greens and browns. Come back a few months later and harvest your compost! Here’s a breakdown on the whole process. I used sticks cut from some unidentified roadside nitrogen-fixing tree locals use as a windbreak. It’s a soft wood and easy to chop, but you can use anything you like from bamboo to oak to PVC. 4-5′ lengths are good, as you want the pile to reach at least 3′ tall and you need some stake depth to drive into the ground. I had already cut up some rough material and thrown it down before putting in the stakes, but it’s better to put in the stakes first. 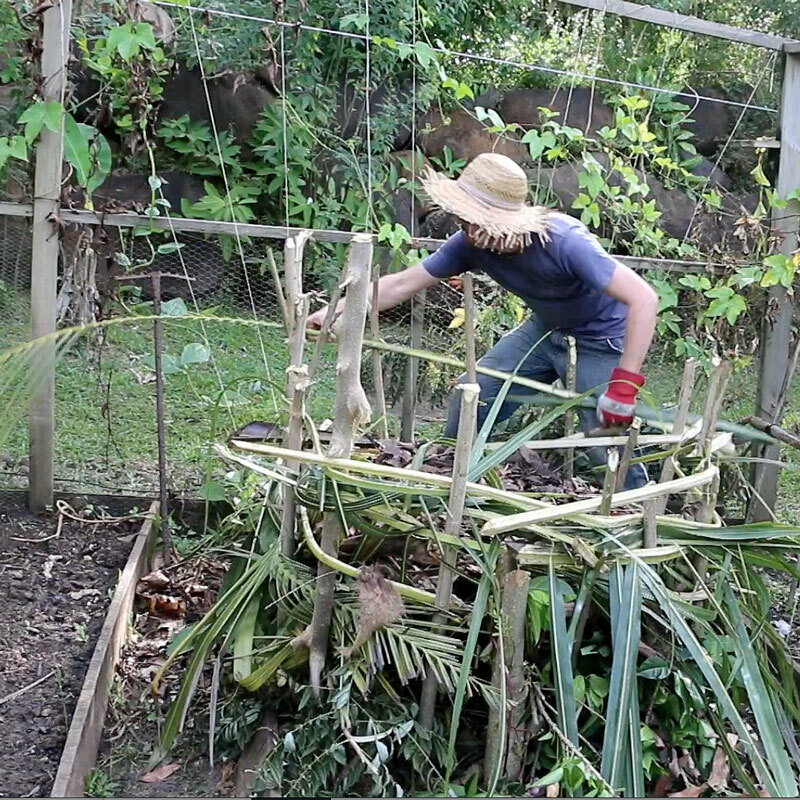 Cornstalks, hedge trimmings and other rough materials filled with air pockets make a good compost pile foundation. 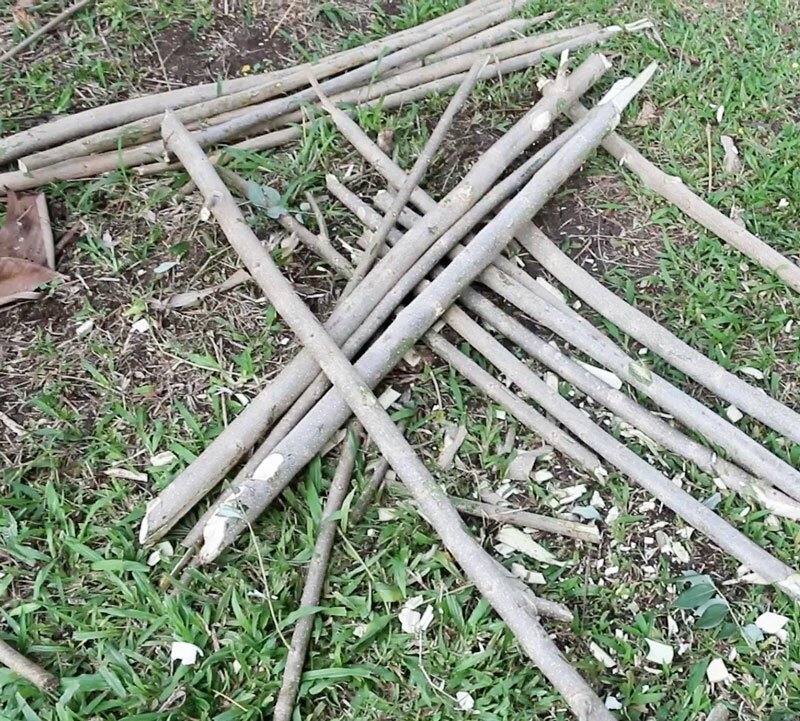 In the case of this pile, I used chopped twigs and leaves from the nitrogen-fixing trees used for the stakes, some jasmine and hibiscus trimmings and a papaya tree. 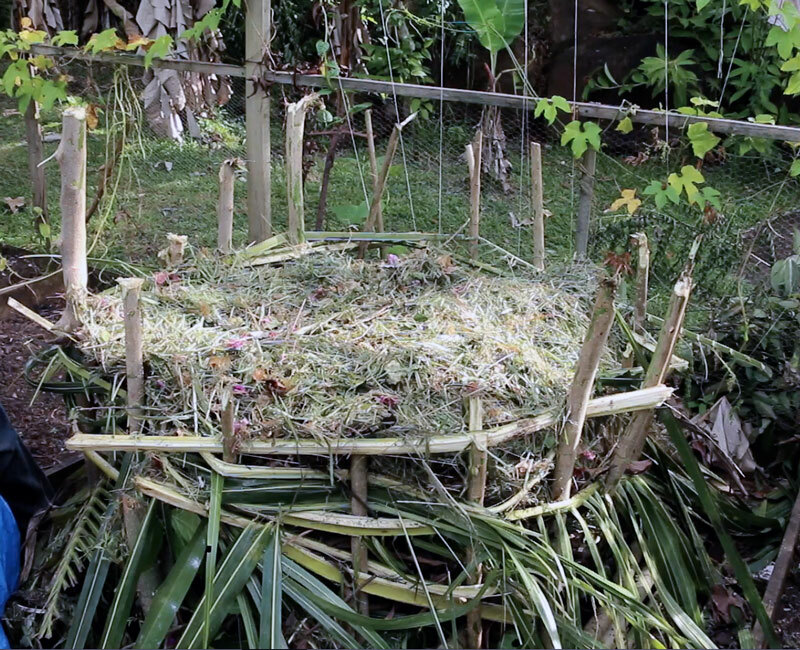 I can’t make a good basket, but I’m not bad at simple compost pile weaving. The idea is to hold in the compost while still allowing some air through into the pile. This also supports the stakes. In a temperate climate you could replace the palm fronds with grape vines, tall grasses, cattails or other plant material. As I state in the video, these leaves have a lot of dirt in them. That soil contains microbes which will help break everything down, so I didn’t bother adding a few shovelfuls of soil as I normally would when making a compost pile. Get that nitrogen in there! Grass clippings are a really good compost pile starter – if you have them, use them. Just keep laying greens and browns until you’ve made the pile nice and tall. 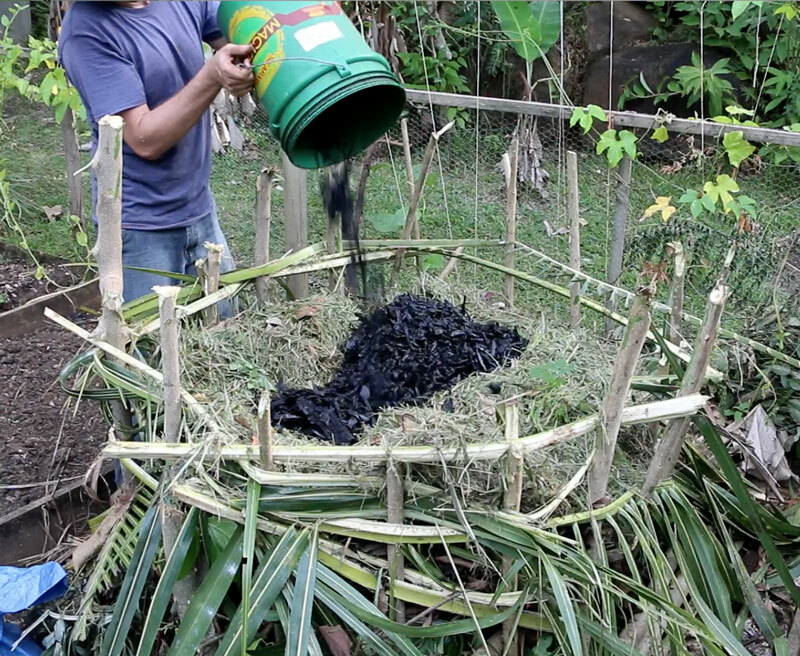 You can also throw in biochar if you have it. It won’t really help the composting process, but my hope is that it will be charged up with nutrients, bacteria and fungi as the pile rots. 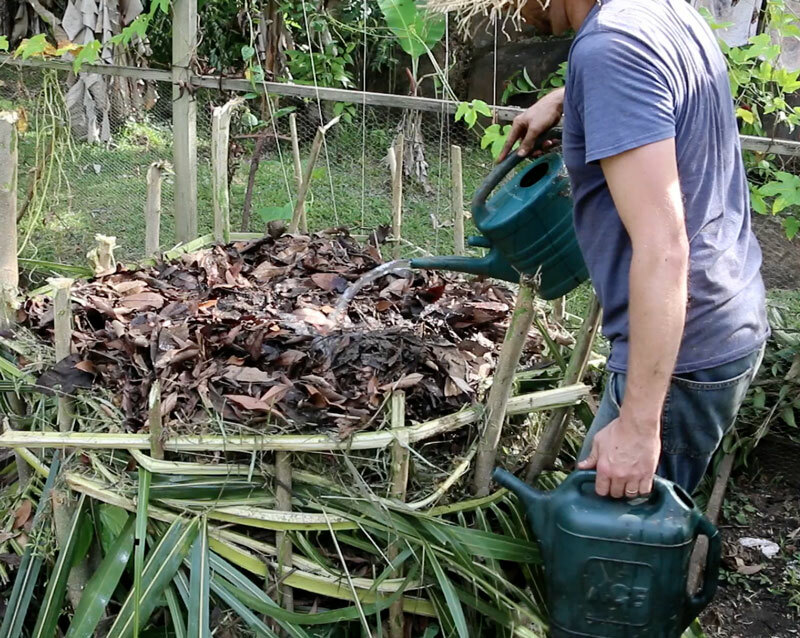 This is important: composting uses a lot of water, so get some on at the beginning. If most of your materials are dry, you might want to water each layer as you build the pile. I was too lazy to do that so I soaked it from the top before finishing the final covering layer. Covering the pile hold in heat and moisture. Sticking with my locally available materials, I used banana leaves. It’s going to decay and become humus over time, hot or not, perfect ratios or not. 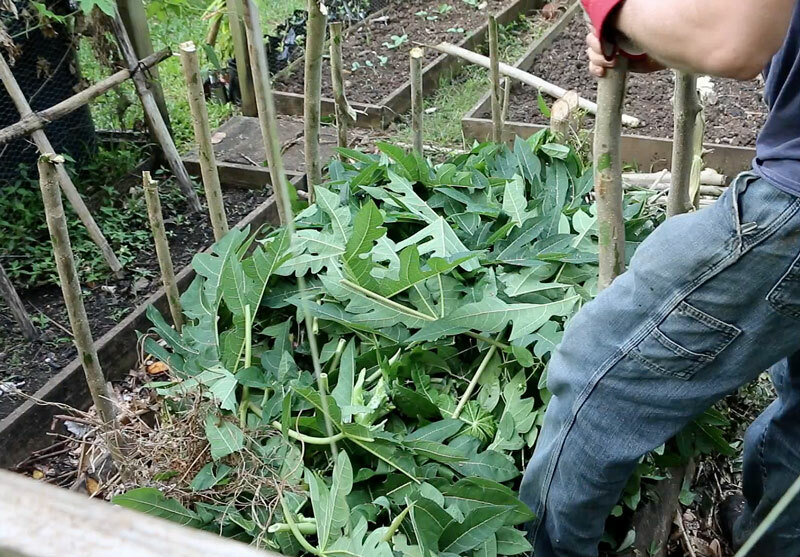 In a few months you can turn this pile over and sift out the good stuff – or just push it around over the garden bed beneath and get planting. Finally, for some serious composting inspiration, get my book Compost Everything: The Good Guide to Extreme Composting. Get out there and get composting!